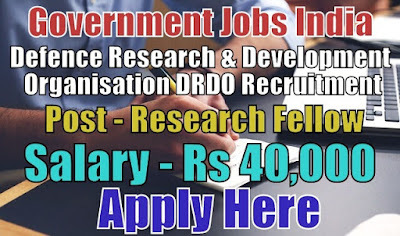 Defence Research and Development Organisation DRDO Recruitment 2018-19 (Ministry of Defence, Government Jobs in India) notification for 05 junior research fellow and research associate posts. All legible and interested candidates have to attend walk-in-interview on (03-02-2018). 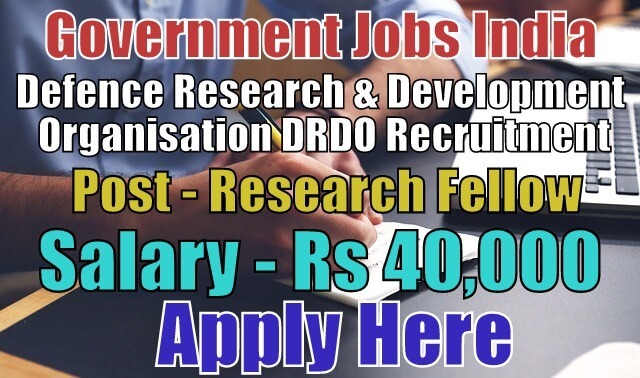 Further information about Defence Research and Development Organisation recruitment entrance exam 2018, vacancies, salary details, DRDO jobs and careers, application fee, DRDO government jobs educational qualifications and all other details/information about this post is mentioned in details below. Age Limit - For DRDO recruitment, candidate age should lie between 18 - 35 years. To know more about age details, click on the detailed advertisement. Last Date for Submitting Application Form - All candidates must attend walk-in-interview on (03-02-2018). The interview date may extend to another day if the number of candidates are more.